Director Sergio Martino and star Daniel Greene team up for a second time to follow up their cyborg arm wrestling film Hands of Steel with the more grounded tale set in the world of boxing. Greene stars as Bobby Mulligan, a blue collar pugilist who is scrapping for a shot at the title. While Mulligan tangles in the ring, the real fight is outside the squared circle where the crooked world of boxing, headed by Giuliano Gemma as the villainous Martin Duranti, conspires to bring him into the world of fixed sports. With the help of Ernest Borgnine as his girlfriend's ex-fighter father, Bobby vows to fight all his fights on his terms. Daniel Greene is not the most charismatic actor, but as a meat headed boxer, he comes off realistically. It's only in monologue or during scenes with actors such as Gemma or Ernest Borgnine where his flaws bring a noticeable. Borgnine is one of the The Opponent's greatest assets. The veteran actor brings great personality to what could have been a nothing role, and the scene where he beats the tar out of Greene is worth the price of admission. Italian actor Giuliano Gemma makes a big impression as the crooked boxing promoter, but more memorable was 1977 Miss Sweden, and View to A Kill Bond girl, Mary Stavin as Gemma's trophy wife with the hots for Greene's boxer. Keely Shaye Smith, better known as Mrs. Pierce Brosnan, appears here in her sole film appearance. As a director, Sergio Martino is something of a chameleon. Helming The Opponent under his real name, instead of the nom-de-plume Martin Doleman he was frequently using in this period, it is clear that Martino took this film more seriously. At the end of the day, it seems like very little more than a Rocky knockoff appearing some twelve years too late. Characteristically, Martino's film had a journeyman-like quality to it, and all the things you would expect from a sports movie, shocking losses, training montages, a crisis of conscience, are all on display. 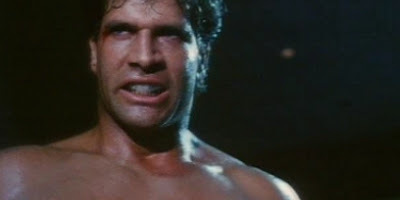 There are actually several montages paired with the fight themes from The Opponent, "Fight Back" and "Victory" both sung by Italian hard rocker Pat Heaven, and their appearances make for high points in the film. As a sports film, The Opponent comes up lacking and derivative, but for fans for Martino and Greene, there's enough here to make it worth watching.